I’m now back from my break. During my time offline I managed to finally get Demon’s Blood’s sequel finished and ready for edits and proofing, and achieved a lot of other offline things too. Of course I am very glad to have my Internet back and look forward to sharing with you my new releases, book reviews and all other things book-related 😀 I hope everyone is well and I’ll be posting more once I’ve fully caught up with everything. Seventeen-year-old student Nat Lawler doesn’t know her orc from her elf bow. She’s never swung a sword before, never ridden a unicorn, or fought a troll outside of the internet. And yet here she is, trapped in a fantasy world and tasked with defeating its evil queen, Drensila the Black. Thankfully, some of Nat’s roleplayer friends were thrown into the mix too, and join her on her epic quest. They’ve spent their lives preparing for this moment, but now it’s time for action, because this fantasy just got real! Trolled is the first novel in the Trolled saga and follows the exploits of Nat Lawler, her boyfriend and his roleplaying friends when they are transported into the middle of a real life fantasy adventure. When Nat is talked into joining her boyfriend Terry and his friends LARP-ing (Live Action Roleplaying) she never imagined that they would end up being transported to another realm and aligning herself with Elves and Dwarves to fight against the evil Drensila the Black. Taking things in her stride, Nat embraces her new-found destiny as the chosen one, but her new path soon drives a wedge between her and Terry. Nat realises that this isn’t just a fight to save the inhabitants of this other world, but to protect her friends. If she fails then they might never get home. Trolled is a really fun read. The style of writing is upbeat and filled with British slang and pop culture references that made me smile on many occasions. Nat is a flawed but very likeable heroine whose stubbornness and determination gets her into trouble on more than one occasion. The supporting cast develop as the novel progresses and whilst at first they seem a little bland they quickly come into their own. There are some darker moments, but overall this is a light-hearted and entertaining read and I am looking forward to reading the second novel in the series. A riveting zombie thriller like you’ve never read before. Ten years after the zombie apocalypse destroyed civilization, ‘Last Mayor of America’ Amo faces the loss of everything he’s built. He wants to be a good man. He wants to save his people. But what is good, and who are his people any more? Now the demon is coming. He will save or break the world. ‘The Stand’ meets the zombie apocalypse, packed with gore, twists and heart-stopping chills. The Loss is the fourth novel in the Zombie Ocean series. Set ten years after the zombie apocalypse that destroyed most of Earth’s human population, Amo and the other survivors face a new threat that could well be the end of them all. I really enjoyed returning to Michael John Grist’s Zombie Ocean series. Ten years have passed in the series since the third novel and the survivors have been doing their best to rebuild New LA. Characters have grown and changed, gone from strength to strength and it was great to see just how even the minor players had developed. The action is as fast-paced as ever and the description used does a terrific job of immersing you into the world that the author has created. I very much liked how the zombies are still an integral part of the story and were not side-lined in the face of the new threat. The Loss is an excellent continuation to the series and I very much look forward to reading the fifth novel. Character Biographies for Eric and Adam added to Perfect World’s website! Blythe Sol has a New Year’s Resolution, but it’s not your typical self-improvement plan. She wants to end the conflict between the government and the Resistance once and for all—by sneaking into Washington D.C. and putting a bullet in President Drummond’s skull. If she can cut the head off the snake, the genocide of the Bionics might finally end. But if she fails, she will surely bring retaliation crushing down upon the entire Resistance. Blythe and fellow soldier Dax Janner are already coping with the loss of people they loved. When their dormant feelings for each other begin to rekindle, they struggle with feeling anything positive after so much suffering. The return of Gage will only confuse matters more. As the terrorist sect known as The Rejects begins to work hand in hand with the government to push the Resistance toward all-out war, the battle will be brought to their doorstep. Will the movement stand tall and conquer—or collapse under the strain and be destroyed for good? 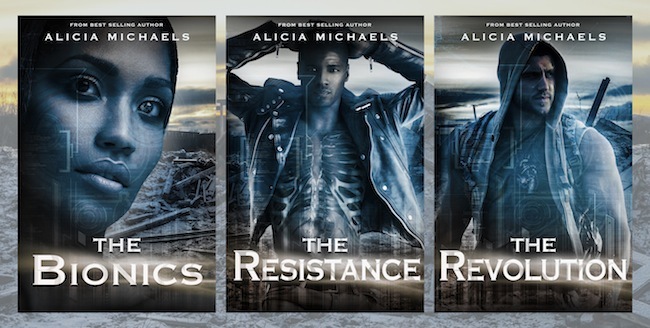 The Revolution is the thrilling third novel in the award-winning Bionics series by Alicia Michaels. 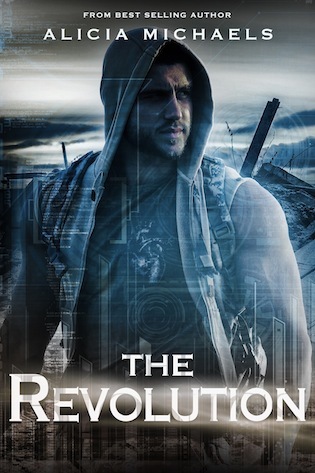 Grab book 1 – The Bionics for FREE!